Julia and I have travelled the world extensively. We consider ourselves seasoned travelers. So I found my nervous anticipation of making this trip strange. When I set off for Antarctica in 2007 I did not have butterflies in my stomach. 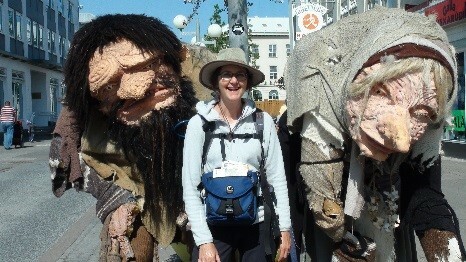 In 2008 before we traveled clockwise around the world I do not recall not sleeping before we left. And I had no anxious memories before we flew our small airplane around America in 2008. In fact, I recall sleeping like a baby before all of our other many world trips. So why did I feel so anxious about this journey? Is it the peril our destinations are facing that makes me feel so uneasy? The thought that we might be glimpsing the world's northern ice sheets for the last time? In the far distant future historians will look back at the twenty first century and discover that we were the generation of humans that through our actions and, more so, inaction caused the world's atmosphere to drown in carbon dioxide. We sat back and watched our movies and baseball games feeling all the while that we couldn"t do anything else. That, surely, it can't be as bad as they say? Everything thing will work out, won"t it? Anyway, no matter what I do I can't change anything. These future historians will discover a world changed by us all. A world where the great Arctic and Antarctic ice sheets simply melted away. They"ll give this period a name. 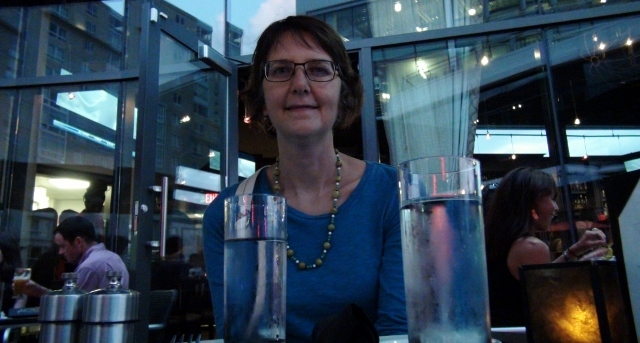 The technical name they"ll use is the Anthropocene; the age of mankind. But I"m sure they"ll think of our time as the great age of shameful excess and mindless human hubris. 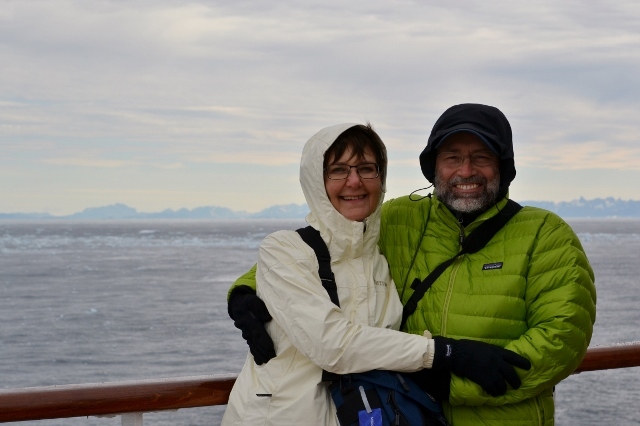 The irony is that as Julia and I travel ever northward is search of what will be our first and last look at the world's melting ice worlds, we"ll contribute to its demise as the transportation systems we use add more carbon dioxide to our precious atmosphere. Like it or not, we are all part of the problem. Raw littlenecks (his brother-in-law harvested them from the Westport River at the mouth of the ocean) served with an Asian Mignonette sauce. Steamers (soft shell clams) pressure cooked with red pepper and sweet vermouth. Toasted ciabatta bread with roasted garlic oil and topped with a pureed spicy romesco sauce of red bell peppers, caraway, cumin, champagne vinegar and almond slivers. Fresh corn "off the cob" sautÃ©ed with garlic and red chili. Grilled shrimp with homegrown homemade scape pesto made from the tops of his homegrown garlic before they flower. Simple light salad of baby greens with a white balsamic and fresh cracked pepper vinaigrette. As I said, it was just a "simple" lunch. Thank you so much Tom, the food was delicious, and your company even more wonderful. In the evening Julia and I met with Sandy and David. They both looked great and hadn"t changed a bit. We hadn"t seen them in five years; not since we flew our airplane around America. Many stories were exchanged and the time was spent well with our friends. We explained the adventure that lay ahead of us and they politely tried to stay focused as our many destinations dragged on. 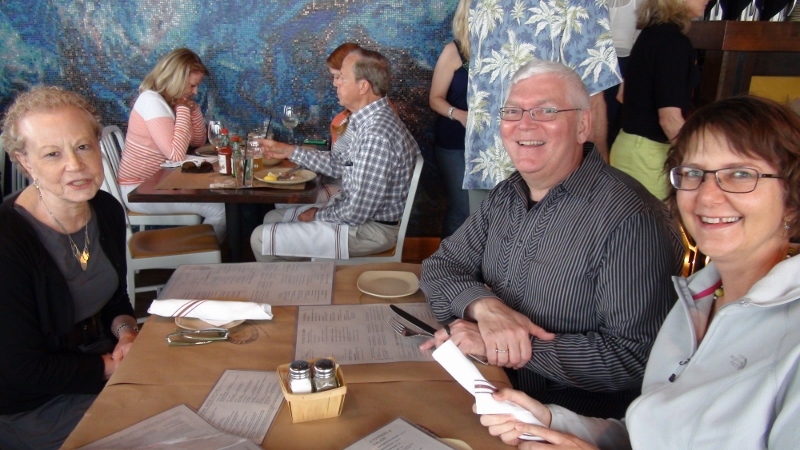 Life is good when you have friends like Tom, Sophie, Sandy, and David. 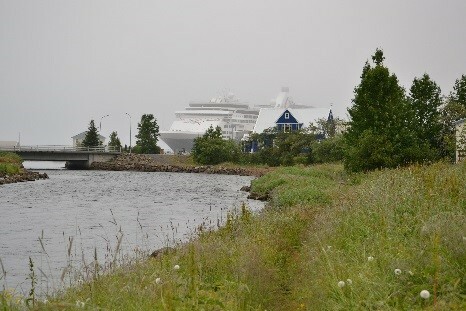 Julia and I got up early with much anticipation of today's boarding and embarkation on the Cruise Ship ms Veedam. We walked to the port from the hotel as it was only a hop, skip, and a jump away. 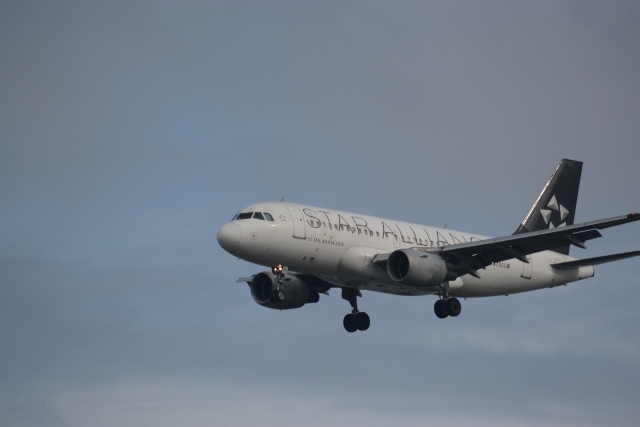 The boarding process was painless and well organized, which we were very glad of. We soon found ourselves onboard the ship and made our way to our cabin. We had discovered that the best cabins were those amidships (the middle) of the ship as they were less affected by the relentless rolling and pitching of these seagoing vessels. The cabin was larger than we"d expected, which we were also glad of too. It is very much like an average hotel room, only with the added character of a balcony overlooking the endless Atlantic Ocean and a foghorn constantly blasting every few minutes. After unpacking we began our exploration of the ship. The ms Veedam is not a big cruise ship, as cruise ships go, but she's not small either: she's a 57,092 ton, 719 ft. (219 m) long, 11 decked ship with a top speed of 22 knots (41 km/h or 25 mph). We made our way to the upper observation deck of our new home and were entertained by the plethora of vehicular activities. Beside us was the fuel barge refueling the Veendam for her long voyage ahead. 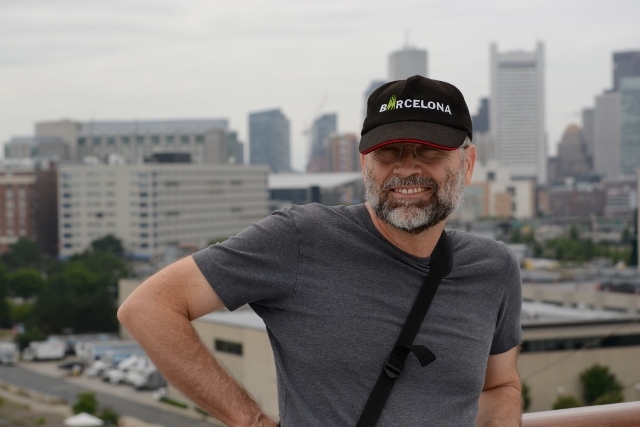 Overhead were many jet aircraft landing into Boston Airport, and to our sides were giant container cranes loading and unloading tons of plastic stuff, no doubt from China, for enthusiastic American consumers. We soon discovered that deck six was the only deck open to the outside. We found ourselves walking around, and around, and around the deck until we had completed our regular 2 miles a day. Suddenly there was a loud blast of the ship's foghorn and we cruised off leaving Boston and the good old US of A in our wake; before us was nothing but ocean and fog; thick billowing fog. Call me Ishmael, sorry I mean David. I"m drawn to the sea, but I"m not sure why. It's not as if I"ve had great exposure to it. I"ve been on only three other cruises before this one. In the eighties I cruised the South Pacific Islands on a Russian cruise ship, which by the way subsequently sank off the coast of New Zealand. Then in the nineties I cruised the Caribbean. Then in 2007 I cruised to the Antarctic. I"m not an able bodied seaman I"m, in fact, very susceptible to seasickness. So why cruise? Well in this case it's because of the destinations. The Arctic regions are very inaccessible particularly where this ship is going. As I see it, it's worth my while to put up with motion sickness if it means I can see what's left of the great northern ice sheets from the luxury of a floating hotel room. You never know what the weather has in store for you when you"re on the open ocean. Since we left Boston the Veendam has been surrounded and engulfed in a thick white fog. So thick we cannot see the wake left by the ship. When the ship sails in fog it must sound it's foghorn at regular intervals, day in and day out. We have lived with this blast of the ship's very loud foghorn since leaving Boston. It's eerie sailing in the open ocean completely surrounded in fog and the incessant foghorn is driving us crazy. The remote far northeasterly Canadian province of Newfoundland is home to the little village of Woody Point on the Bonne Bay. It is pinched between the massive and senescent Gros Morne mountain range and the vast expanse of the St. George's Bay. 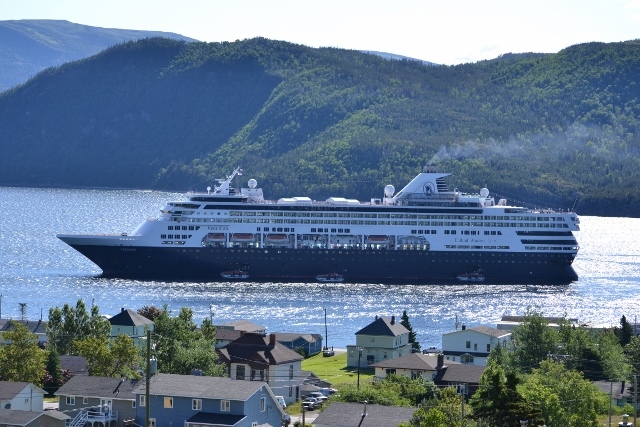 Our ship anchored off the quaint village of Woody Point and we disembarked via tender boats to the shore. From the quaint village we walked a five mile hike that climbed 1,300 feet to the hills behind the little village. 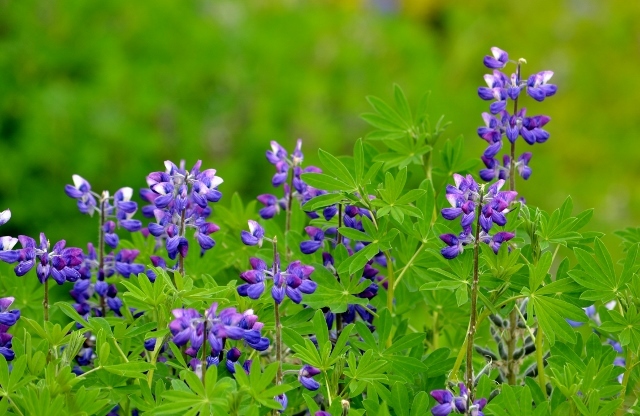 A long the way we encountered wild roses, carnivorous pitcher plants, flowering clovers, and many other wildflowers unknown to our western American eyes. Many unidentified birds serenaded us as we hiked under the aqua blue sky, which was barley broken by a few puffs of fluffy clouds. 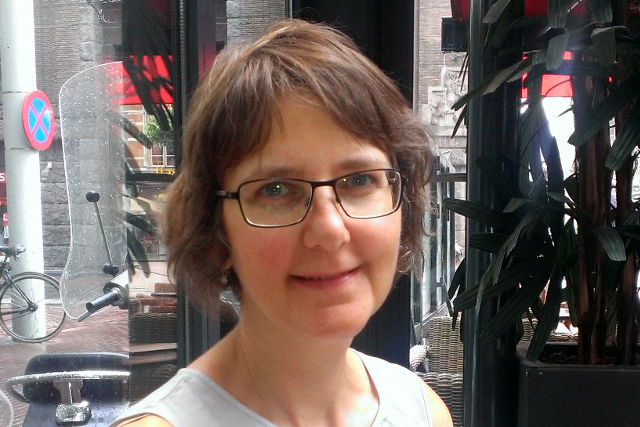 The wind was certainly cold and Arctic in origin, but the unhindered sunshine was bright, sharp, and warming. From the summit of the hills we surveyed the beauty of Bonne Bay. 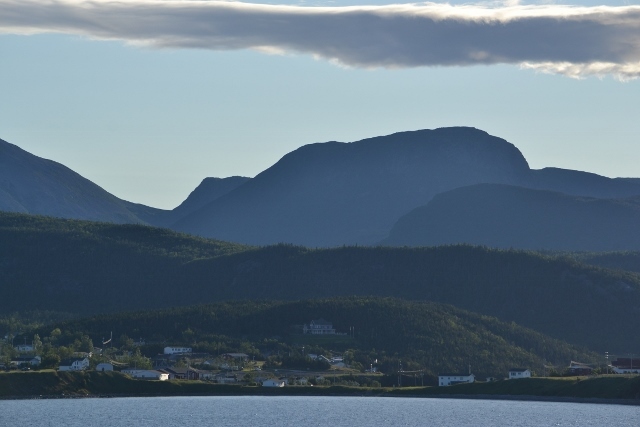 The Gros Morne mountain range is sculpted by immense glaciers long since gone from this world. The mountains are very, very old and are scared by eons of erosion. 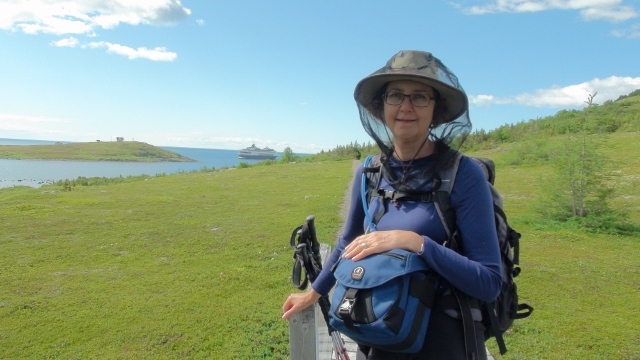 Bonne Bay is one of the most beautiful places Julia and I have had the pleasure to hike. We woke and found ourselves in one of the most northeasterly regions of North America; the very inaccessible Red Bay. We had heard many tales about why the place was called Red Bay. The most obvious explanation was the cliffs of red rock that surrounded the tranquil cove. 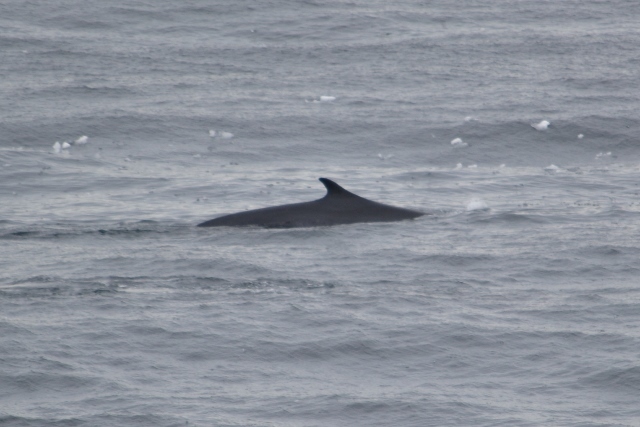 We had also been told that it derived its name from the color its waters turned after one of its infamous whale harvests. However, while on an eight mile hike Julia and I discovered, soon enough, where the far-off bay really derived its name. The place is swarming, in the summer months, with binge eating, black fly, blighters. These nasty little flying monsters are of the carnivorous variety and took great pleasure in inundating us with bites. They caused rivers of deep red blood to flow from our necks, foreheads, and scalps. 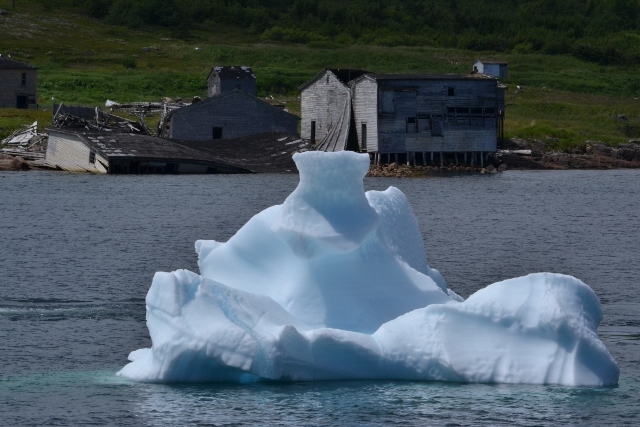 Regardless of our relentless tormentors we really enjoyed the view from the 520 foot hill that gave us excellent views of this remote iceberg filled harbor. Once back onboard our floating hotel I was able to access my injuries. I was astounded to count over 50 painful and throbbing bites. Oh well, in time my bites will heal, but the memory of this beautiful place will be difficult to forget. When traveling on the ocean and particularly in extreme regions such as the Arctic the best plans can go astray. So it was with our planned visit to Qaqortoq in Greenland; it was not to be. 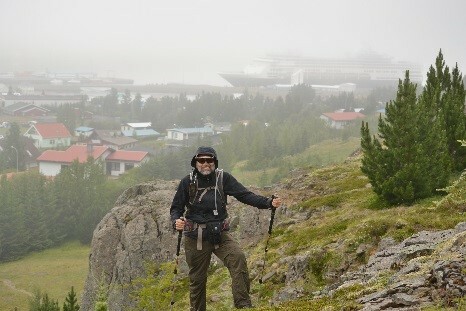 The Veendam had weather behind her and raced to Qaqortoq in an attempt to stay in front of the rain storm. 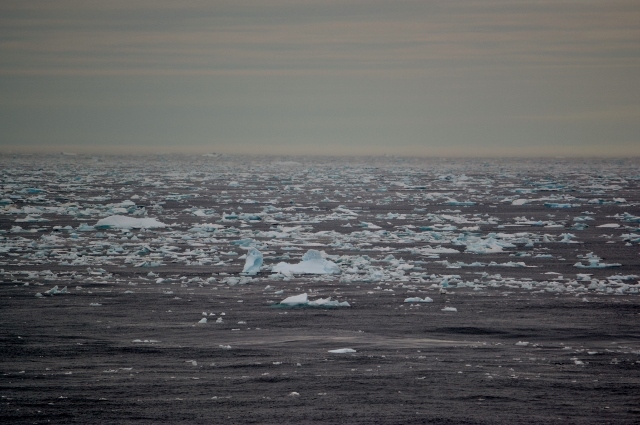 However, when we reached 50 miles off shore in front of our ship lay a vast field of pack ice blocking our passage. 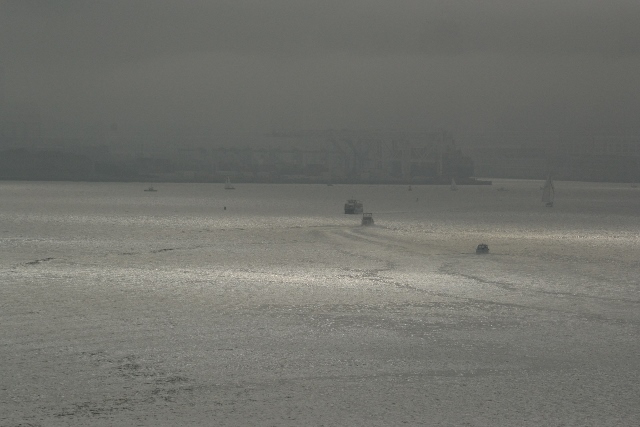 To make matters even worse a fog bank engulfed most of the only navigable channel to our planned destination. The Captain went to plan B and tried to get into Nanortalik, however the further southeast we went the more floating ice we encountered. 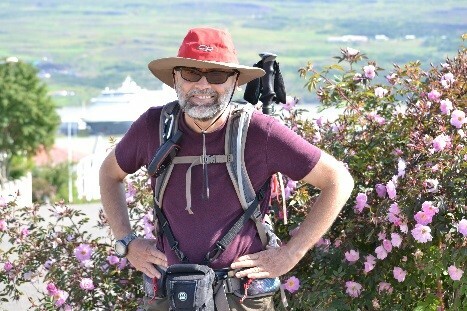 The Captain then went to plan C, which had us head south and then north into the southern fjords of Greenland in an attempt to enter the famous Prince Christian Sund. 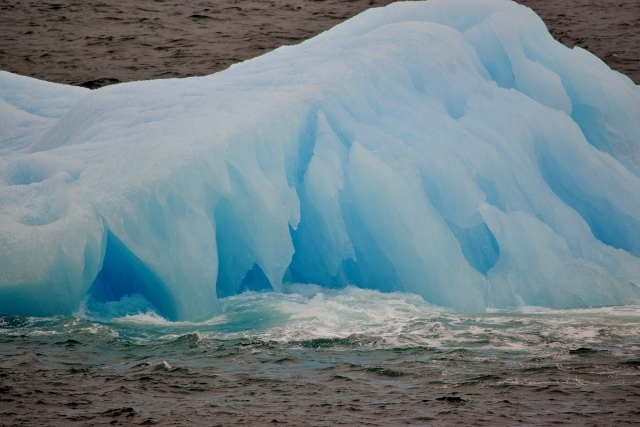 However, once again we encountered the pack ice and had to retreat to open waters. 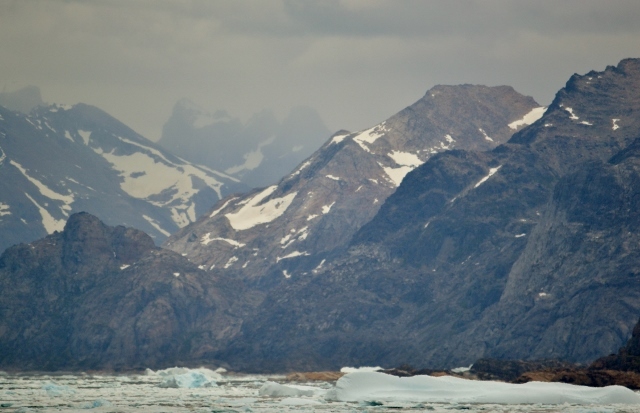 There is always a silver lining to any bad luck; ours was the spectacular views we were given of the rugged and wondrous coastline of Greenland, of the many icebergs and whales our close encounter with the frozen northland allowed. Try as he might the Captain was unable to get us into the Prince Christian Sund. His plan was to enter the sound from the eastern end, as we were blocked by ice from entering the western entrance yesterday, but pack ice once again froze our plans. 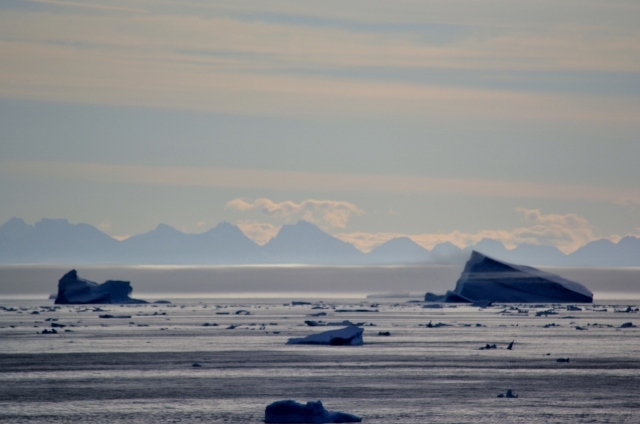 And so, we left Greenland behind us this morning having only seen a glimpse of its rugged and ice-shrouded shores from half a mile out at sea. The ice had beaten us and ensured we were not to set foot on the far-north-land of ice and snow. Before us lay another day on the open and exposed North Atlantic Ocean. The Veendam is well stabilized, but even this technology has its limits. The North Atlantic was not still this day and caused our vessel to toss and roll in the rainy grey seas. Today we sailed close to the spot where the HMS Hood was sunk by the German battleship Bismarck. 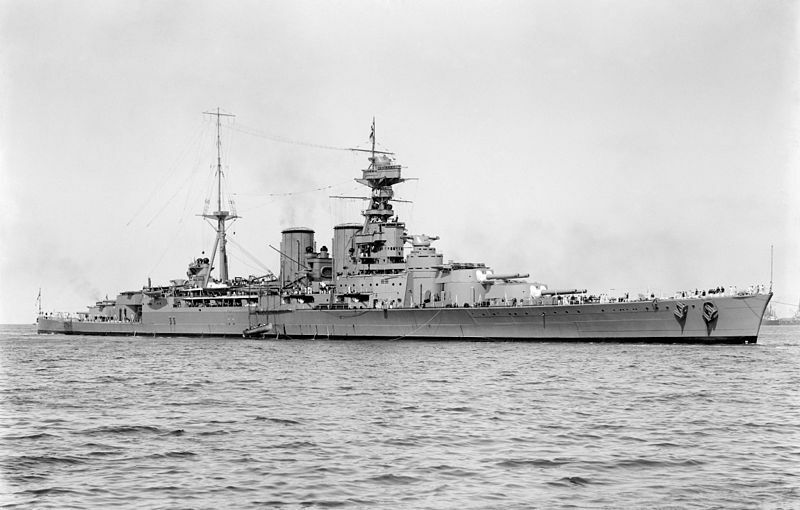 HMS Hood was the last battle-cruiser built for the Royal Navy. Commissioned in 1920, she was named after the 18th-century Admiral Samuel Hood. In May 1941, she and the battleship Prince of Wales were ordered to intercept the German battleship Bismarck and the heavy cruiser Prinz Eugen, which were en route to the Atlantic to attack ally convoys. 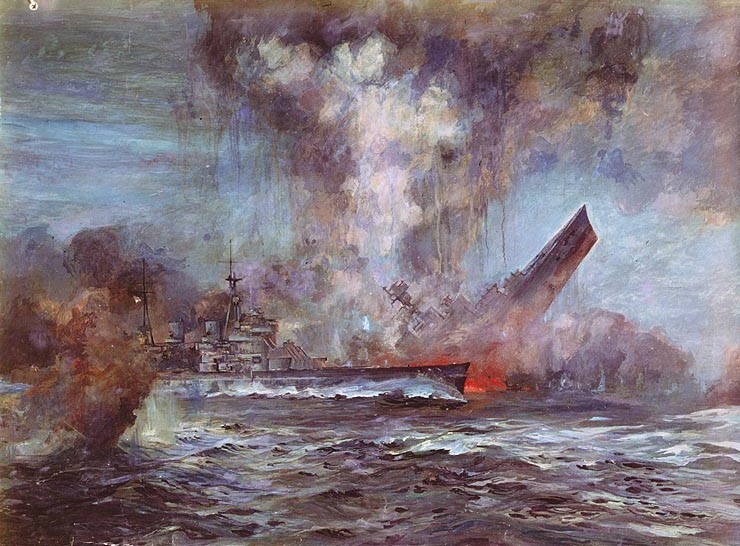 On 24 May 1941, early in the Battle of the Denmark Strait, where we were sailing, Hood was struck by several German shells. One of these shells hit the Hood's magazine and blew her to bits in what became one of the quickest sinking of a British ship. One of the problems of traveling on any form of transportation is the increased risk of picking up bugs. Unfortunately, this was the case for me. I came down with a 24 hour cold, which knocked me out. As I write I"m still feeling a bit under the weather, but the real weather in the Atlantic has been improving; I hope I do soon too. Puffins, in coffins, are dead indeed. Today, we arrived at the northern end of the volcanic island of Iceland, very, very close to the Arctic Circle. 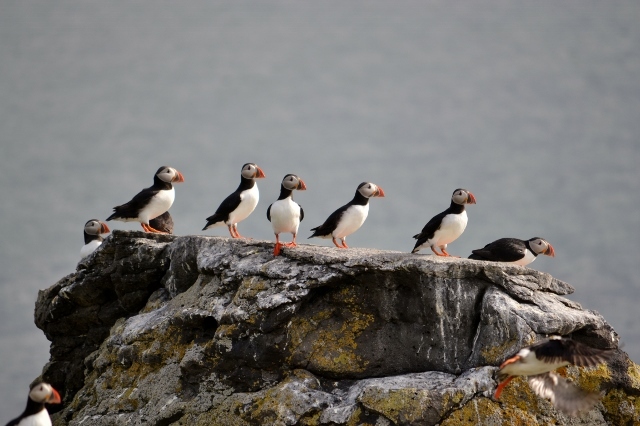 We took our one and only organized excursion to tour the Vigur Bird Island, (the island of Puffins). After docking the Veendam at Isafjordur we disembarked and immediately got on another local boat that set sail to the island of many birds. It's a private island in one of the many fjords surrounding Isafjordur. The island is really a farm, but the farmer allows tours, which endow the eager tourist with a close up inspection of Puffins, Eider Ducks, Black Guillemots, and the very aggressive Arctic Turn. On our return to Isafjordur Julia and I set off through the quaint village to find a hiking trail. 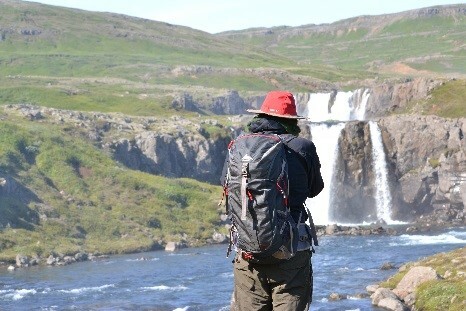 Strange as it may seem, in this pristine land of fjords and volcanos, there wasn"t a good hike at hand. So I persuaded Julia to climb up the steep unmarked side of the fjord cliff behind Isafjordur and bush-bash our own private and scenic trail. We struggled our way across multiple creeks and scree fields, but along the way we drank in the beautiful vistas of the fjord land; plus we came across many wild flowers: dog-roses, daisies, buttercups, geraniums, time, dandelions, and three different orchids. What a great and adventurous hike. Yes indeed, it's a long way to Akureyri, especially if you come from California. Its street are not filled with gold, but rather with Icelandic children on their summer vacation work-assignments. It seems there's been a long standing tradition in Iceland to have their children spend summers cleaning and grooming the parks of remote cities. They don"t at all seem unhappy about this, at least the ones we met, in fact they seemed to be really enjoying themselves. We sure lucked out with the weather so far in Iceland. The sun shone bright and strong all day and enabled Julia and me to walk all around this typical remote Icelandic community; clean, on a fjord, surrounded by tall and rugged cliffs, and over flowing with happy and trusting people, extremely trusting from my perspective. We saw many a bicycle left outside a house with no bike lock on it. And I even saw a woman get out of her car, leave it running with her five year old son in it, while she went into the bakery to get coffee and donuts; amazing! It really is a long way to Akureyri, and certainly a long way from my home. Yes another unpronounceable Icelandic town. But wait this one's not so bad. Just pronounce it: Say-dis-four-door? That's it, you"ve got it! Consider yourself a master of Icelandic. We may never be able to really pronounce the names of the spectacular cities we"ve stopped in, but we sure did enjoy visiting them. Seydisfjordur is our last stop on this incredible volcanic wonderland and it gave us our most amazing hike so far. We walked from the Veendam, for four hours, to the far end of the fjord Seydisfjordur is located on. We have never experienced anything like it; okay just maybe in New Zealand's Fjord Land National Park, just maybe. I simply lost count of all the waterfalls we encountered along our way; each one different and each one breathtaking. As for the scenery all I can say is think of Middle Earth from Lord of the Rings and you"ll have some idea how this stupendous places looks; okay I know New Zealand again. As we set off on our trek we left our trusty ship at the dock with everything steeped in fog. 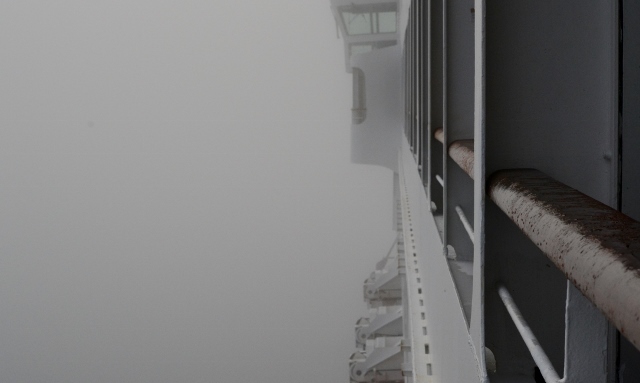 The Veendam had sailed all night in the fog and pulled up to a dock shrouded in mist in the morning. By the way, during our evening sail we had crossed over into the Arctic Circle. This gave me the personal pleasure of having now been to both Polar Regions of the world. 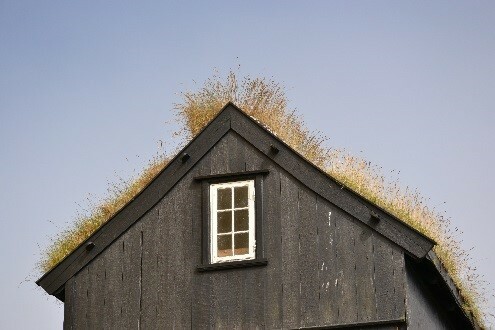 Julia and I continued our walk through the tiny town and up into the fjord with no idea what was surrounding us. We walked past a wide strongly flowing river. We left the town behind us and climbed slowly up to our first waterfall completely unaware of the world we had stepped into. Then as we continued into our world of mosses, waterfalls, rivers, and wildflowers Julia turned, looked straight past me, and said, "Look at that!" I swung around and out of the mist came our first glimpse of the mountainous ice capped world that engulfed us; incredible! As the day went on the fog cleared away and the full glory of Seydisfjordur was revealed to us. As we sat and ate our cheese sandwiches at the top of the stunning fjord we contemplated how the world is truly a gorgeous place, but just how quickly (when left up to the human race) it can be destroyed. Oh well, enjoy it while you can; I guess it"ll still be here after we"re all long gone. Oh mighty Thor (god of thunder) thank you for letting us visit your far northern home, and namesake, of Torshavn. Its fog cloaked tiny serpentine streets and your, really blonde, Viking descendants welcomed us. Did you instruct them (omnipotent god of thunder) to build their homes with sod roofs, or is it something they invented? And why (omnipresent lobber of lightning) do all your young supple women perform all the hard labor jobs in your most flower gardened world? It is good to see that the ancient act of rowing boats furiously about the fjord is still practiced, with vigor (omniscient one). Imagine if Thor really did exist and could throw lightning bolts about along with his trusty hammer; now that's what I call a god, none of this namby-pamby virgin birth nonsense. 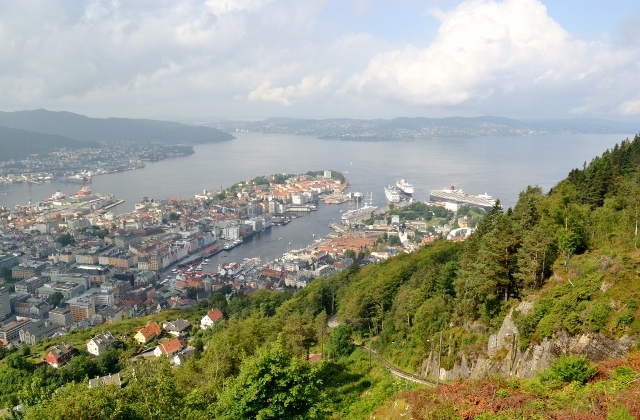 Occasionally when you travel you are really surprised by a destination; Bergen, in Norway, is such a place. 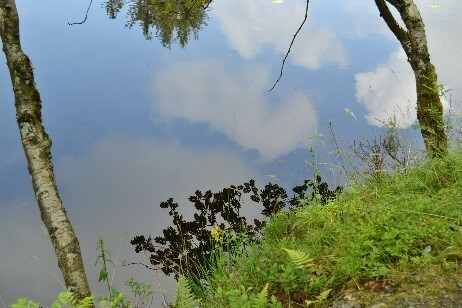 I had expected it to be on a fjord, surely everything in Norway is. But I was astonished at just how steep its beautiful valleys were and how their tree and house dotted sides dropped so sharply into the splendid harbor. So many cities in Europe have ancient and interesting histories, but I was unaware that Bergen is so full of old buildings, many from the 14th century and some much older than this. The museum in Bergen is built on the site of excavated wooden buildings that give you a glimpse into the city's 900 year history. I"d heard something about the funicular train in town. But riding it up the precipitous cliff offered views that I hadn"t expected to be so wonderful. Once at the top of the fjord the hiking trails, lake, and forest I found there were a very pleasant surprise; one which Julia and I took full advantage of. I had no idea how amazing and delicious the seafood market in Bergen would be. Filled with all kinds of smoked fish and even to my utter disbelief smoked whale meat. No wonder we found a Green Peace ship at anchor in the harbor at Bergen. The downside of this must see destination was the pouring rain we encountered in the morning and the very expensive meal we had to pay for at lunch. Oh well, it was worth getting wet and over charged to experience this stupendous place. 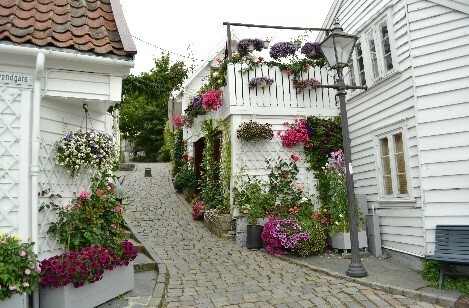 After the experience I had in Bergen I was looking forward to visiting another small Norwegian fishing village. But our next port of call Stavanger was a complete let down. 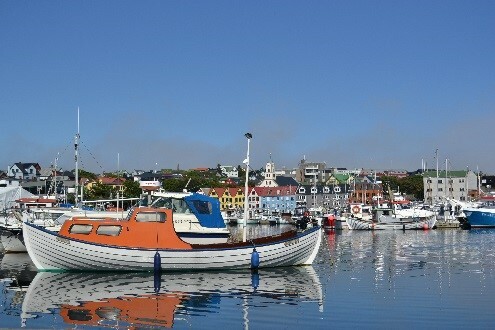 It is certainly a small Norwegian fishing town, but it's much more of a party town than Bergen; much more commercialized. Because of this, we found it filled with litter, mess, homeless people, and all the trappings of an overly busy port. It does have a very antediluvian Catholic Cathedral that is a living record of the very early influence of Irish monk's in Northern Europe. However, this was little conciliation for the state we found the place in. Julia and I did enjoy the many flowers in the gardens of local residents in the old part of town, but I could easily have skipped a visit to this Norwegian town. 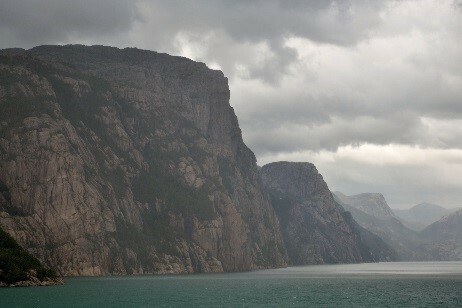 Once we left Stavanger (or stink-vanger as we renamed it) the Veendam began a scenic cruise of the majestic Lysefjord. Now this blew me out of the water! 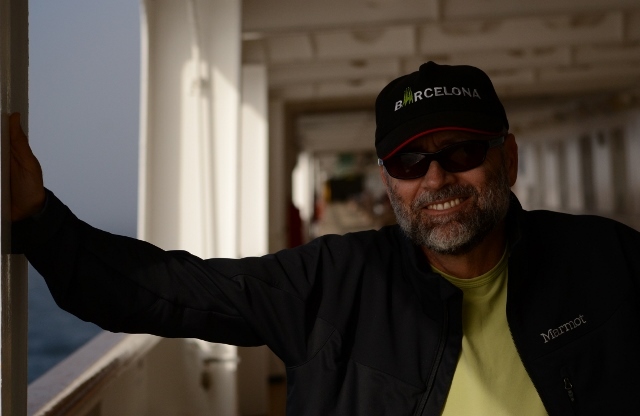 To understand the feeling of sailing the Lysefjord is to imagine that Yosemite Valley had been flooded with water and you drifted through it on a large ship that seemed to just squeeze past the rocky cliffs all around you. Lysefjord engulfs you in enormous granite towers, domes, glacial horns, and deep green forests. Once the Veendam reached to the furthest point it could safely navigate in the deep and long fjord; the Captain stopped the mighty vessel and slowly began to rotate the behemoth 360 degrees; brilliant.